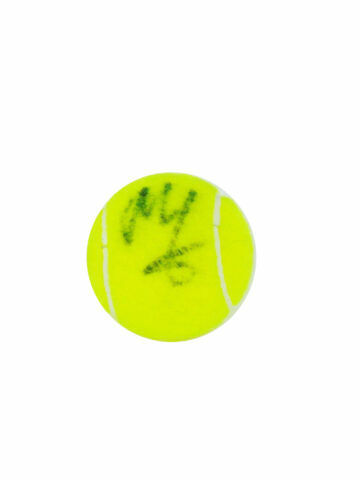 Shop our signed Signed Juan Martin Del Potro tennis memorabilia – autographs from the star on tennis balls, racquets, photos and other items. Many with photo proof. All with Certificate of Authenticity, Fast worldwide shipping and Free UK delivery! Top-seeded Argentinian tennis player Juan Martin Del Potro has been shaking up tennis since his professional debut in 2004. Although his name is not as notorious worldwide as Nadal, Djokovic or Federer, his achievements are just as notable. He began playing tennis aged seven, coached by Marcelo Gomez. Former professional tennis player Ugo Colombini recognised his talent at an early age and remained by his side throughout the initial stages of his career. Del Potro went on to win his first senior match aged just fifteen, defeating Matias Niemiz in Buenos Aires. From then on he showed excellent form, but it wasn’t until 2008 that he experienced a real breakthrough. At the start of the season, his outlook seemed bleak – thanks to a change of coach, injuries and a first-round loss at the Australian Open. Prospects dampened further as he was forced to retire due to injury, then crashed out of the French Open and Wimbledon. But true to form Del Potro bounced back for a successful summer – which set him up for a triumphant 2009. This was the year he claimed his very first Grand Slam title and rose through the rankings to the top ten. Periods of retirement and injury ensued, punctuated by more triumphant comebacks. He has one Grand Slam win to his name, the US Open in 2009, reaching the semi-finals and quarter-finals of the Australian Open, French Open and Wimbledon. Although there have been ups and downs throughout his career, Del Potro is perhaps best known for his record against the ‘Big Four’ – Roger Federer, Rafael Nadal, Novak Djokovic and Andy Murray. He has a 28.17% record against the four collectively – making him one of the best in his category and one of a select few to have won at least three matches against them. Juan Martin Del Potro is known as a character off-court – renowned for his fiery personality and argumentative, competitive nature. Here at Firma Stella we have a fantastic selection of signed Juan Martin Del Potro tennis rackets, balls, caps and other memorabilia autographed by the star. Every item we sell is carefully sourced and supplied with a certificate of authenticity. By signing up you will receive information about our latest sporting memorabilia offers.